The Superman Fan Podcast: Episode #383 Part I: Superman Family Comic Book Cover Dated June 1965: Superman's Pal Jimmy Olsen #85! "Love Me, Love My Beast" is one of those unusual Silver Age stories that, once I get to the end, I want to go back and re-read it from the beginning, in light of the surprise "twist". Doing that in this case makes the story kind of creepy, which I think is a really good piece of writing on the part of the great Bill Finger. "The Adventures of Chameleon-Head Olsen" is one of many "Jimmy Olsen's Weird Transformation" stories, but, in this one, Jimmy really seems to miss the obvious! He's trying to get away from all these thugs out to kidnap or kill him. He can change his head. Why not make himself look like, oh, I don't know, anyone other than Jimmy Olsen? He does this in the end, making himself look like Superman, but he could have avoided a lot of trouble and danger if he'd thought of it sooner. 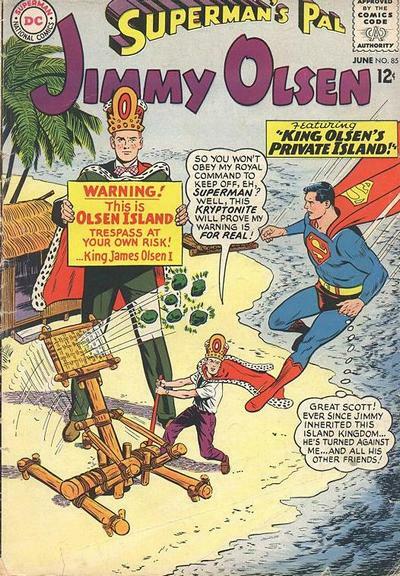 "King Olsen's Private Island" at first makes it seem as if Jimmy has gotten "full of himself", but we get to see that he is really a good friend to Superman, actually trying to protect his super-pal. It also gives us a nice Curt Swan/George Klein/Sheldon Moldoff cover, but I have to say that Jimmy's crown makes him look more like the Pope than a king. I also have to wonder, if he's on what looks like a tropical island, why he's wearing an ermine=trimmed cloak with a short-sleeved shirt. You make a great point about "Chameleon Head" Olsen, which is one of the most unflattering titles ever. I totally missed that point when I read the story. But then, the writer would have had to come up with something else to fill those pages.